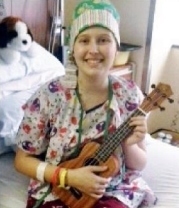 Ukulele Kids Club Brings Gift Of Music | Ukulele Kids Club Inc.
Pediatric patient, Rachel Kiser, is excited to recieve a ukulele. The music therapists of the Department of Cultural Programs’ Arts in Healthcare are delighted to share some exciting news. Last month, we received our first shipment of instruments from Ukulele Kids Club, a non-profit organization whose mission is to donate ukuleles to music therapy programs in children’s hospitals nationwide. While we use a variety of instruments in our sessions, the ukulele is used regularly because it is so success-oriented. Patients can hold ukuleles easily and can operate the strings comfortably. The ukulele can be learned in a short period of time, making it a relaxing leisure activity for children, adolescents and adults. It is pretty difficult to make an unpleasant sound on a ukulele. After seeing a news story about Corey and Edda Bergman, the founders of Ukulele Kids Club, we immediately reached out to them to become part of their program. It was then we learned how their wonderful organization came to be. Mr. Bergman began volunteering to play guitar for patients at the local Miami Children’s Hospital and Joe DiMaggio Children’s Hospital after he and Mrs. Bergman lost their son to a viral infection in 2010. Noticing that many pediatric patients were interested in the guitar, but had difficulty playing while in a hospital bed, he decided to give a ukulele to a patient to try. Seeing the success, Mr. Bergman began contacting music therapists at various hospitals outside of Florida and offering to donate five ukuleles at a time to be distributed by music therapists. 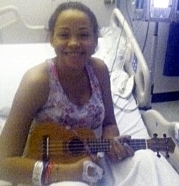 Since then, Ukulele Kids Club has supplied 500 ukuleles to 81 children’s hospitals thanks to the generosity of donors. The same news story inspired Richmonder Veronica “Ronnie” Wyatt to contact the Bergmans and offer to purchase ukuleles for patients at the VCU Medical Center. Mrs. Wyatt and her husband, Tim Wyatt, co-own Pecan Jacks™, a gourmet candy shop with two locations in the Richmond area. Mrs. Wyatt later contacted the music therapy team about the contribution she and her husband made and we received the first five instruments. Two ukuleles have been gifted to pediatric patients. Both were elated and couldn’t wait to start jamming on their brand new ukes. It wasn’t long before they could play a variety of chords and several different songs. Arts in Healthcare is grateful to the Wyatts and the Ukulele Kids Club for their generous donation and support of pediatric patients.